All medical treatments come with some risks, including Artificial Reproductive Treatments (ARTs). It’s very important that you discuss all aspects of any procedure and that you understand any potential complications. The risks of ARTs may include adverse reactions to fertility medications and problems during pregnancy. In some cases, ARTs have been linked to an increase probability of miscarriage, low birth weight, prematurity, and neonatal encephalopathy1,2. However, these risks are not fully understood and the subject of ongoing research. Most ARTs recommend the use of fertility medications to help improve conception chances. There are a wide range of medications that may be prescribed, including lucrin/synaral, cetrotide/orgalutran, human chorionic gonadotropian, and clomiphenes. Some of these drugs are taken orally, while others are injected. Severe side effects are uncommon, although in some cases there are mild reactions. These may include restlessness, headaches, hot flushes, and mood swings. Any unexpected reaction should be followed up with your fertility specialist. Egg collection using laparoscopy or trans-vaginal ultrasound guided aspiration does present some risks. The ovary or adjacent pelvic structures may bleed, although this usually settles by itself. Slight bruising around the ovaries is common and may take a couple of days to heal. More serious risks include pelvic infections and accidental bowel injury. Some patients may also be allergic to anaesthesia. Among the risks of ARTs, multiple births is the most prevalent. It’s not uncommon to have twins or triplets as a result of ARTs. There are some disadvantages of multiple pregnancies. Obstetrically, the body is placed under much greater stress when carrying two or more babies. This can increase the risk of complications such as miscarriage, premature deliveries and problems during labour3,4. Statistics have also shown that there is a four times greater risk of death prior to birth or within the first week after delivery for twins compared with a single baby. This risk is seven time higher in the case of triplets. Furthermore, the risk of cerebral palsy is much higher in multiple births compared with singletons5. For these reasons, many regulatory bodies impose restrictions on the number of embryos that can be implanted. In the UK, the Human Fertilisation and Embryology Authority (HFEA) introduced a two-embryo transfer policy in 2001 for women under the age of 40. This ensures that no more than two embryos can be transferred during ARTs. 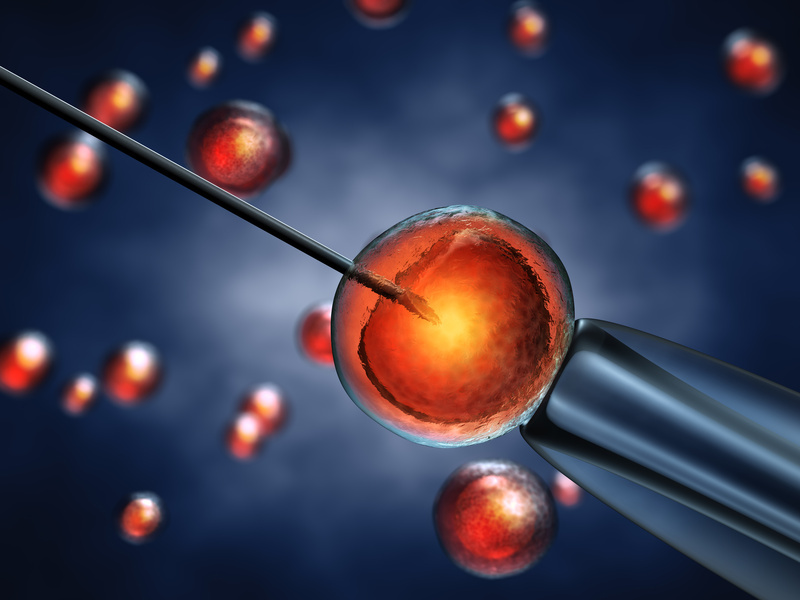 The only circumstance where three embryos may be permitted is if the patient is 40 or older. The best way to reduce the risk of multiple births is to only have one embryo transferred. OHSS is a rare, but potentially dangerous reaction to fertility drugs that are used to help stimulate egg production. Symptoms include stomach pains and swollen abdomen. In severe cases, vomiting, nausea, reduced urine output, shortness of breath and painful cramps may develop. These symptoms typically develop approximately a week after egg retrieval and are as a result of cysts developing on the ovaries and fluid retention in the abdomen. During treatments such as IVF and ICSI, patients with high hormone levels and producing large volumes of follicles are at higher risk of OHSS. Usually around 5% of patients will develop some OHSS symptoms. Mild fertility drugs like clomifene very rarely induce OHSS. Even stronger gonadotrophin derived drugs may only cause very mild symptoms. In 1-2% of patients, OHSS can be life threatening when fluid from within the abdomen enters the chest cavity. It’s impossible to predict who may be particularly at risk of this severe condition. However, clinical scanning of the ovaries during ARTs will help to identify patients that may be at risk. It’s very important that if you start to experience any of the symptoms described that you immediately contact your fertility specialists. It should also be noted that there is also an increased risk of deep vein thrombosis associated with OHSS6,7, however this is rare. When an embryo implant outside the uterus it is known as an ectopic pregnancy. 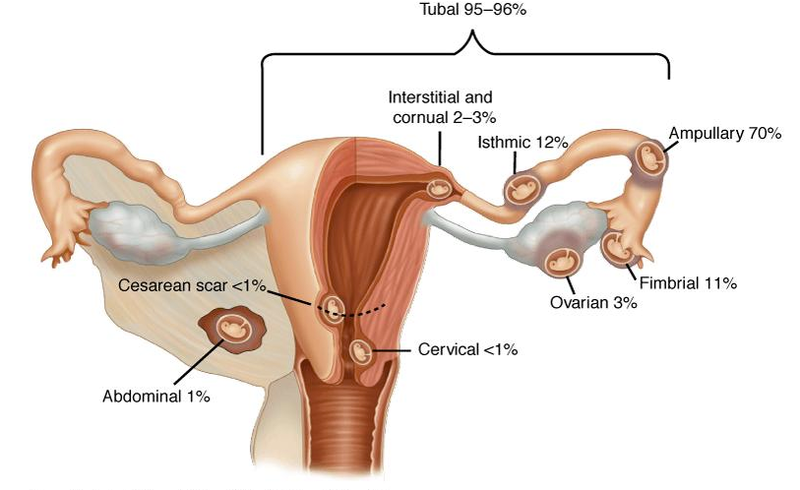 The fallopian tube is the most common site of an ectopic pregnancy, although occasionally it may develop in the ovary, and less commonly in the abdominal cavity, caesarean scar tissue, or the cervix. The risks of ectopic pregnancies appear higher among women undergoing ARTs, especially if there are problems associated with the fallopian tubes8,9. Symptoms include one-sided low abdominal pain. This is followed by dark brown or red vaginal discharge or bleeding. Pain will increase as the pregnancy continues. The biggest risk from an ectopic pregnancy is internal bleeding following a rupture. It’s important to monitor hCG levels and have regular blood tests. A six week scan will also confirm if the baby is growing properly in the uterus. In the general population the risks of birth defects are low. In Europe approximately 2% of babies are born with birth defects. Some research indicates that fertility treatments may double the incidence of defects, although this risk remains very low10. Other research has found an association between ART techniques and longer-term health problems11, 12. However, whether this is a direct link or the result of other factors has not been conclusively determined. It is possible that these problems may be linked to underlying subfertility associated with the parents. There is still a lot of research investigating possible links to long-term health problems associated with ARTs. The good news is that there are some studies finding no association between assisted conception and health issues. One recent review of 106,013 children born as a result of ARTs found no amplified risk of cancer compared with naturally conceived children13. More studies like this are necessary to improve our understanding in this field. There is a lot of emphasis placed on the physical risks of risks of ARTs, however there are also emotional risks. One major risk of ARTs is that a couple is still unable to conceive. In some cases eggs may not fertilise, embryos don’t develop properly, or there is no implantation. Even if a pregnancy is achieved, a miscarriage may still occur. These emotional risks must be acknowledged and discussed prior to undertaking assisted reproduction. In the case where a pregnancy is not achieved and further treatment isn’t a viable option, it’s important to seek counselling if necessary. In the UK a single cycle of IVF can cost up to £6,000. Before initiating treatment, the patient must be aware that although success chances appear high at 70% or more after three cycles, that still means that statistically 3 out of 10 couples do not achieve a pregnancy – after having paid between £10,000 and £15,000 depending on the fertility clinic and their individual package. The simultaneous disappointment caused by the high costs of a failed treatment combined with the disappointment can put enormous emotional and financial strain on a relationship. A recent development in the UK is the availability of an IVF refund plan. How do you manage this risk? Every couple has its individual fertility profile, which is the product of the female and male fertility “potential”. These depend on many factors such as family history, age and lifestyle. The female partner needs to have had various gynecological checks to ensure that her reproductive system is ready for pregnancy. Health of ovaries, ovulation process and fallopian tubes must be confirmed. The male partner needs to implement various changes in his lifestyle to ensure that he can product the best possible sperm. This means that sperm count, motility and morphology need to be as high as possible. Read our checklist of 10 things men can do to improve their fertility and list of sperm-boosting nutrients. Before you go into IVF or ICSI treatment and if you live in the UK, keep in mind that you may qualify for an IVF refund plan. This is possible, because the costs of three cycles of IVF in Eastern Europe is unlikely to exceed £10,000. The agency will reclaim the total cost of the treatment from the NHS and it is it fails will recover its money from insurance.